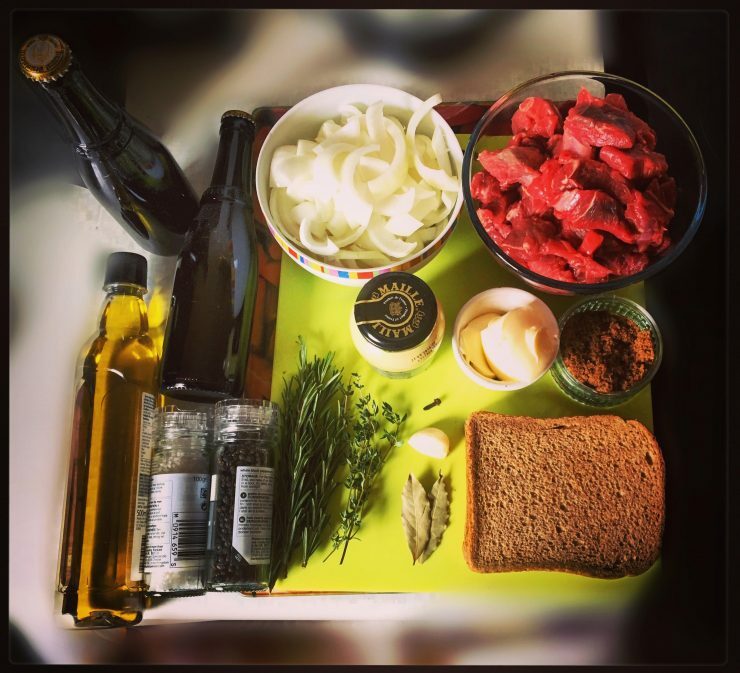 I’ve tried cooking with booze before – usually white wine in my risotto – but I figured it was time I tried cooking with beer since it’s my favourite drink. I wanted to use the coveted Westvleteren 12 so I knew I had to pick a recipe worthy of the best beer in the world. I sought opinions from other beer lovers and most of them recommended the same dish. Stoofvlees, also known as stoverij or carbonade flamande. According to the powers that be at Wikipedia it’s a traditional Belgian, French Flemish, Northern Brabantian and Zeelandic Flemish beef and onion stew made with beer, and seasoned with thyme, bay leaves and mustard. You can’t use just any beer, it should be a dark Belgian abbey beer, making it the perfect recipe for my Westy 12. I trawled Google and YouTube for the perfect recipe and found loads of variations, including some with bacon and even chocolate in them, but opted for this recipe from The Hungry Belgian blogger because it looked simple, hearty and traditional. The ingredients were all easy to get hold of, though I did go out and buy a decent cast iron casserole pot to do it justice. After buying all the food I realised I didn’t have a cheesecloth or muslin bag for the herbs (I’ve never made a bouquet garni in my life) but after trawling around four different shops I finally found a muslin square in Dunelm. I measured out all the ingredients so they were ready to plonk into the pan, and laid them out so I wasn’t faffing about looking for things. I’m a messy cook so it made things much easier. I had the iPad set up in the kitchen showing the recipe and off I went in true Nigella Lawson style. She probably doesn’t ping steak across the kitchen while she’s seasoning it or litter the floor with onion but it was a worthy effort. 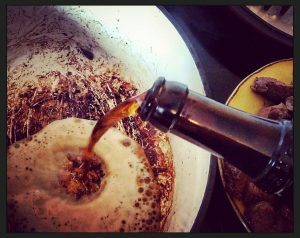 I was most excited about pouring in the beer, and when I de-glazed the pot with it, watching the bubbles and breathing in the smell were hugely satisfying. I only made one modification to the recipe, as I’d bought 2.5lbs of beef and the liquid wasn’t quite covering it, so I topped it up with a little bit of beef stock. This is a recipe that takes patience with a cooking time of two-to-three hours. I gave it the full three so the sauce thickened nicely. I wasn’t quite sure when to add the mustard-covered bread so, based on another recipe I’d watched on YouTube, I did this at the half way mark. I put it in mustard-side-down and waited till it had fluffed up and gone all soggy with the juice before stirring it through the stew to thicken it up. I realised around this point that I’d forgotten to buy fries to serve with it, as was recommended, so the boyfriend kindly went on an emergency shopping mission while it bubbled away. I won’t lie, I was very pleased with myself. It tasted as good as it smelled, which was AMAZING. The flavours in the gravy were so good and the beef was tender. I tested it another twice (just to make sure) then had to put the lid back on the pot and throw the spoon in the sink so I didn’t keep on sampling and spoil my dinner. Apparently this is a dish best made the day before, but I was impatient, so I ate it for dinner tonight, served with a helping of fries and a big dollop of mayonnaise. But I made tons, so I saved half of it to have another day, and it’s only going to taste better. Can’t wait! One thing’s for sure…this won’t be the last time I’ll be cooking with beer.